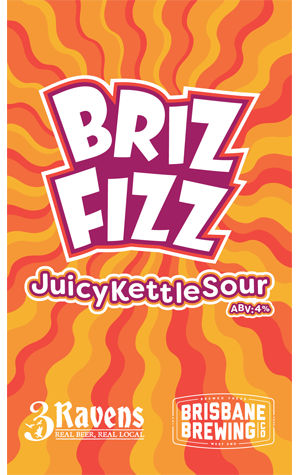 Those who've kept a keen eye on all things 3 Ravens and Mash Brewing in recent years will know that their Berliner Weisse series kicked off with a beer called Wizz Fizz. So it shouldn't be too hard to work out what's going on in this collaboration with Brisbane Brewing Co. The beer was brewed by Satoshi from BBCo with the Ravens crew in Thornbury. The idea was to brew something kettle soured but with an aggressive hopping schedule akin to 3 Ravens' Juicy IPA. Thus a golden beer was soured overnight using a very fruity souring culture before a second boil was performed and the first of four hop additions was made to the whirlpool. London Ale yeast was used to contribute further fruitiness while the beer was additionally hopped on transfer to the fermenters as well as at various stages afterwards – including dry-hopping mid-ferment with a large dose of hop hash, and again post-ferment "for maximum hop punch". Furthering the fruit factor was the choice of hops: newcomers Idaho 7, Eureka! and Denali. The brewers tell us "all three hops deliver the flavour of a pine forest, while the aroma leans more towards lemonade and gooey mango."